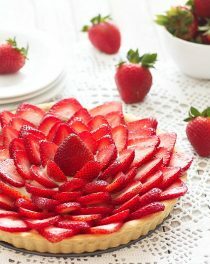 Impress your guests at your next gathering with this eye-catching strawberry tart. Don’t be put off by the long list of ingredients, it comes together pretty easily. First you blind-bake a pastry shell, then you fill it with a silky-smooth lemon pastry cream. The strawberries add the perfect finishing touch, decorating the tart beautifully. The shell and the pastry cream can be made a day ahead. When you’re ready to serve it, slice the strawberries and finish assembling the tart. For the shell I used “pasta frolla”, a basic Italian pastry dough used for pies, cookies and tarts. Use flour that is low in gluten (all-purpose flour is fine but pastry or cake flour is better), it will make the dough more elastic and less likely to crumble. Use cold butter out of the fridge. Work the ingredients quickly to avoid overheating the dough. Once you have kneaded the ingredients into a ball, wrap it in cling film and let it rest in the fridge for at least 30 minutes. 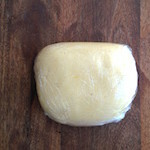 You can also make up several batches at one time and freeze them, well wrapped in cling film, for up to 1 month. Pastry cream makes the perfect filling for cakes, tarts, and pastries. 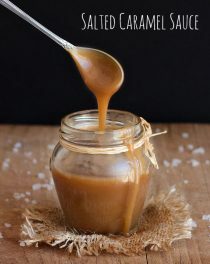 It’s very versatile and can be flavored with lemon, vanilla or chocolate. After it has cooled you can even fold in some whipped cream to lighten it up. I used strawberries for this tart but you can use your favorite fruits and berries: raspberries, blueberries, peaches, kiwi, etc. 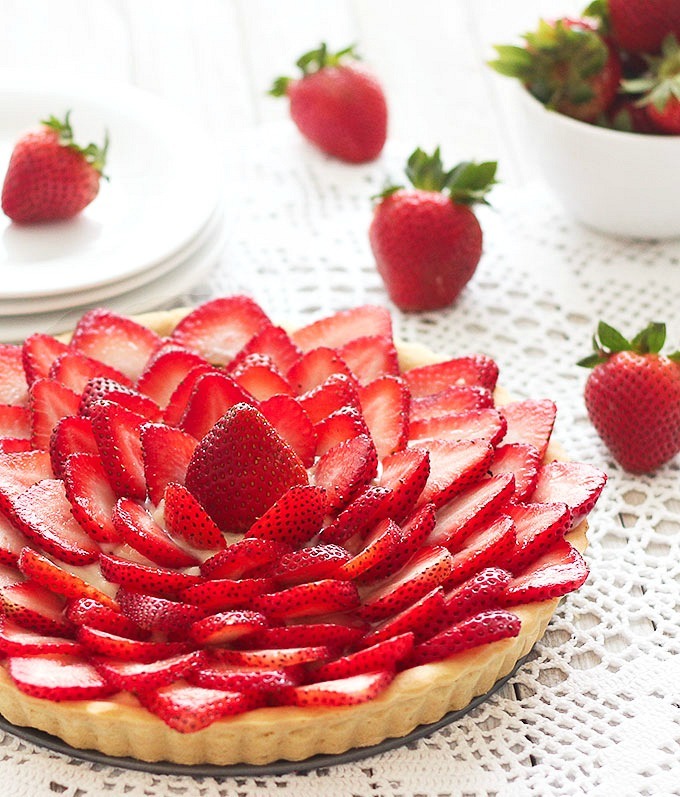 I hope you will enjoy this strawberry tart! Put the flour, butter, salt and baking powder in a food processor and pulse until the mixture is the texture of coarse cornmeal. Transfer it to a large bowl, add the sugar and egg and bring the dough together into a ball, without overworking it. Flatten the ball slightly, wrap it tightly in cling film and refrigerate for 30 minutes. While the dough is chilling, prepare the lemon pastry cream. In a medium bowl whisk together the sugar, egg yolks and grated lemon. Add the flour, a couple of tablespoons of milk taken from the total amount and continue beating until well combined. Place the remaining milk and lemon zest in a saucepan over medium heat until the milk just comes to a simmer. Remove from heat and discard the lemon zest. 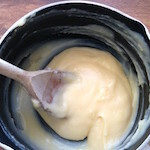 While whisking, slowly add the milk to the egg mixture and return the mixture to the saucepan. Cook over medium heat, stirring constantly, until the cream has reached the desired density. 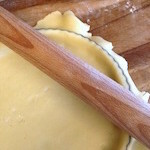 To prevent a skin from forming, press a sheet of cling film directly onto the surface of the pastry cream. Refrigerate until chilled. On a floured work surface, roll out the pastry about 0.5 cm (1/4 inch) thick. Using a fork, prick the bottom of the pastry shell. Bake the crust for 20 to 25 minutes or until golden brown. 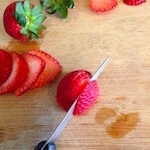 Hull the strawberries and slice them 1/2 cm (1/4 inch) thick. 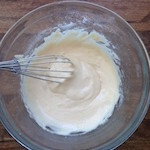 Remove the pastry cream from the fridge, whisk until smooth and spread an even layer in the crust. 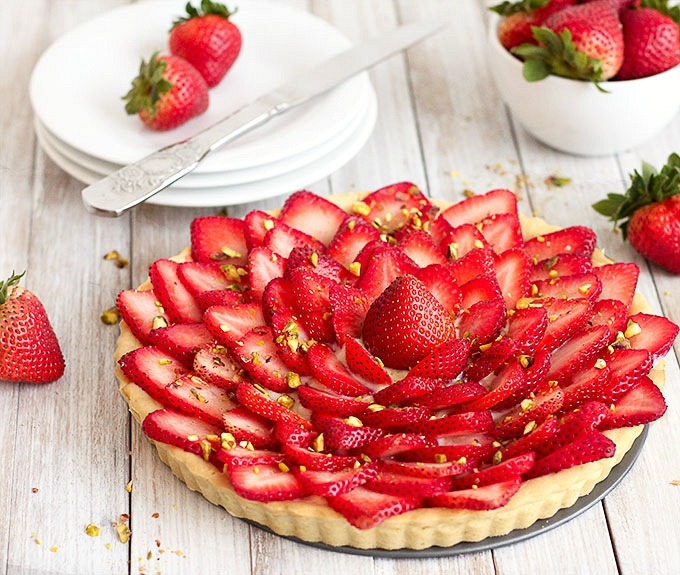 Starting from the outside and working your way to the center of the tart, place the strawberries, in an overlapping circular pattern. Serve the strawberry tart immediately or refrigerate until ready to serve. Does the taste change if these are refrigerated for upto 5 hours or so? This is just gorgeous! Perfect for so many occasions from elegant to casual! Lovely! 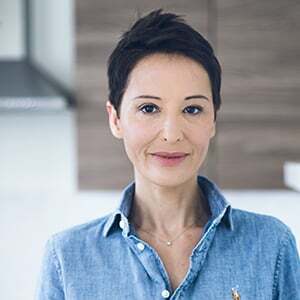 Hey Elena, As a child, Strawberry Pie/Tart was my favorite dessert and it is still in my top five. Your pie looks and sounds divine and you photograph is beautiful. This tart is absolutely gorgeous. I love that you are pairing strawberries with lemon. Simply stunning. Cannot wait for strawberries to be in season. One could, I suppose, also cheatand use a top quality shop pastry case. Oh this is just stunning!! 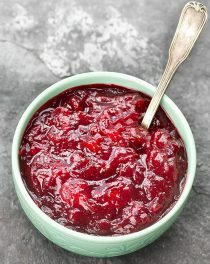 The strawberry topping looks so easy to do, but is SO effective!! Just so beautiful and looks absolutely delicious. I am soooooooooo easily drooling over this. I love it. so gorgeous – an elegant idea for afternoon tea! perfect as strawberries start to come into season. yum! 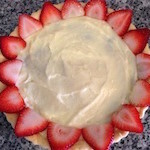 Stunning recipe, your strawberry tart with pastry cream is exactly the one I used to have when I was a child in France. Love it SO much!! Incredible dessert! I can’t wait for strawberries to come into season here! I think this is the most beautiful dessert I have ever seen! Nice work Elena! What a beautiful tart! It looks so fresh and delicious with all those ripe strawberries over the top. I wish I had a slice now. Quick question: do you fill the your crust with beans for the blind bake? Hi Regina! If the dough crumbles, add one tablespoon at a time, iced cold water. It will come together. I just made this strawberry tart this morning. It turned out great. It looks so pretty. I think it looks so pretty i could sale this tart. Ha Ha. I can’t wait for my husband and children to try it and tell me what they think. Thank you it was so easy to make too. I am so glad to hear that, Kathleen! Dear Elena,may I know if I can use the pastry cream with your italian sponge cake? i would like to fill the sponge cake layers with strawberries and maybe your pastry cream, do I still need to put sugar syrup? Thanks!! Hi Shannon! The pastry cream is perfect for the sponge cake. 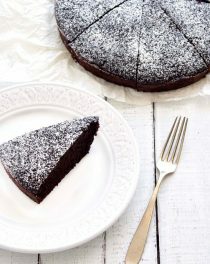 -Yes, you still need to soak it with syrup or juice as the cake is quite dry. But be careful not to soak it too much or it will fall apart. 🙂 Just use a pastry brush, it will not make the cake too sweet. – No, I wouldn’t ice the cake. – It will hold as long as you don’t leave it outside the fridge for too many hours and the weather is not too hot. This is my first time making pastry cream – will this set up more as it is chilled? Or do you really have to cook it down to the consistency you want from the beginning? I cooked mine for about 10-12 minutes (do you have a recommended cooking time? 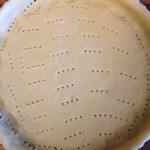 ), constantly stirring, but I didn’t want to over do it – now I fear, upon assembling my tart, that it won’t hold up to slicing – luckily, this is a test tart 🙂 Thank you! Hi Josie! It will continue to thicken as it chills. When the pastry cream is ready, you’ll see large bubbles coming to the surface. Depending on your stove, this may take about three to five minutes. We made this yesterday along with two other desserts for a gathering of friends. It turned out beautifully, and was very well received by our friends. Thank you for sharing the recipe! I have never made any tarts in my life, but I’ve made this tart about 4 times now. It is absolutely delicious and you cant go wrong. Thank you for sharing this great recipe. A added some blue berries and raspberries a couple of times, goes really well with the cream and looks great too!